It’s been a long time since I posted soemthing in the Reader-to-Reader section of my blog. I have been meaning to post this for a few months, but finally made the time today. 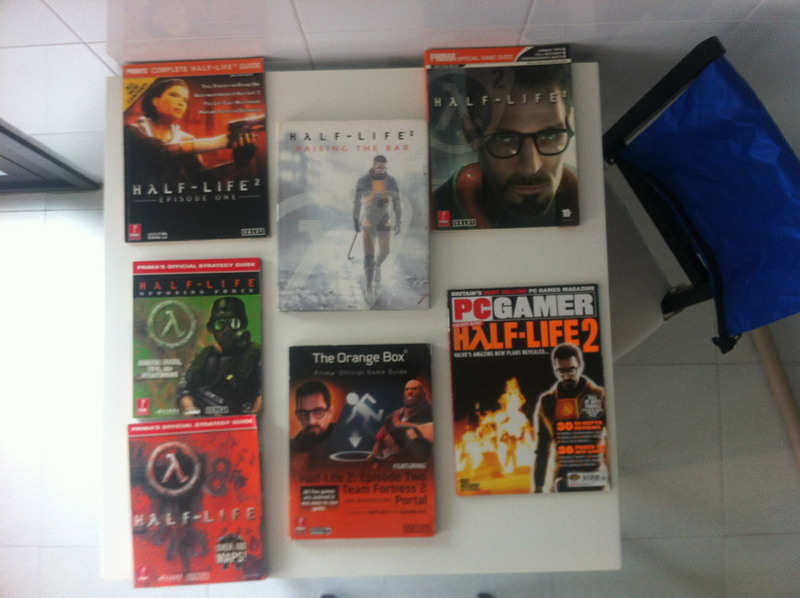 I present to you my collection of Half-Life memorabilia. I don’t own that much, partly becasue I can’t afford to and partly becasue I don’t want too many things like that. Under each photo is a brief description, and if you have any questions just ask. I may have a look for some other boxes of the games, might be nice to have the full collections, inclduing all the versions of HL2. I’m pretty sure I have the Half-Life Generations packaging somewhere. If youa re wondering about the blue back in some of the photos, I keep all the stuff in that, which is a waterproof bag. I am terrified of them getting soaked in a flood (it does happen in my town but it’s highly unlikely – I’m just over-protective). Okay, here are my photos…. Here is my books collection. It includes a magazine, which was when Half-Life was first announced. I don’t think they have ever published a Blue Shift manual, which is a shame. Latyer this year, I might try and get my Opposing Force manual signed by the guys at Gearbox. This is the inside cover of Half-Life 2: Raising the Bar. 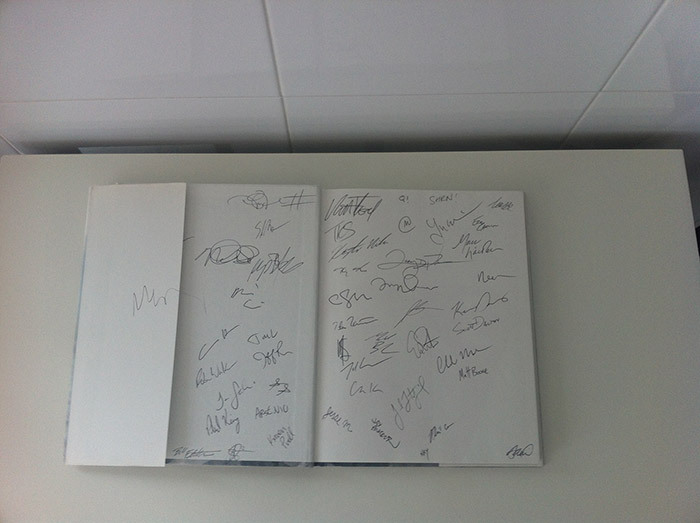 Can you recognize the signatures? Here is my HL2 retail box, showing the inside, plus a double-sided poster and finally, a sealed Half-Life T-shirt. I actually got a working Steam account with the box, that still works today. 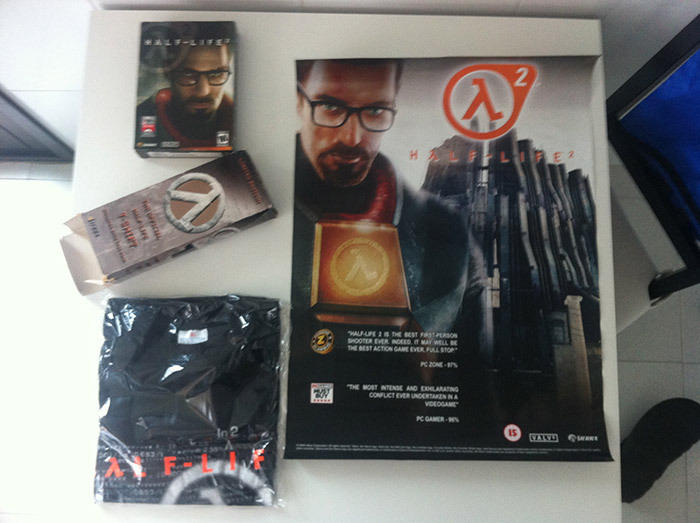 Here is the other side of the poster and also the front of the HL2 box. 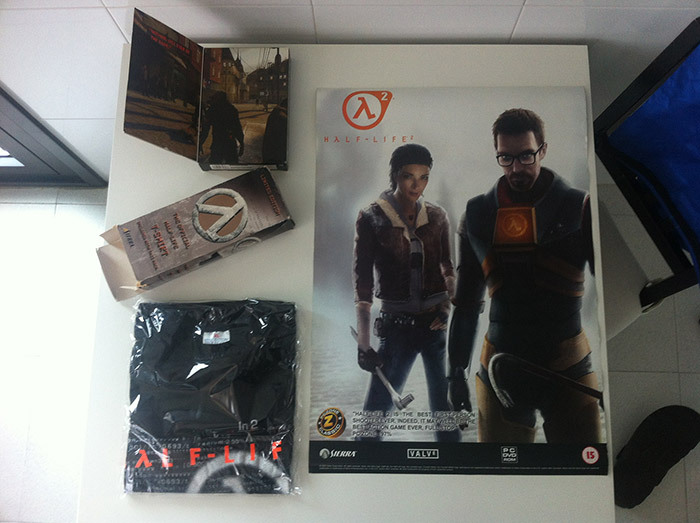 So, as with all the other Reader to Reader post, I would love you to share your Half-Life / Valve Memorabilia. Just make a comment and either send me the images directly or upload them to Imgur.com and I will put them on my server and embed them in your comment. I’m looking for to seeing what you have. Umm…I have the retail disc of Half-Life. So, that’s cool, aaaand….well, that’s it. I’m not the collector type, I buy a video game and that’s it, no special editions or posters or anything like that. I’m still a huge Half-Life fan though and every second that passes, I wait for a possible next game in the series. I still have the Half Life Generations packaging, with all the games included. I’d go out of my way to get it signed, if I knew that the guys from Valve would be at Con in a more official capacity than they have over the years. I don’t have much, but I have those things and I will never part with them. I still have my original HL1 disk bought in 1998, a HL1 “Game of the Year” disk bought in 1999 and a Blue Shift/Opposing Force disk bought in 2001. The other game The Orange Box was bought in 2007! I’ve been doing the gamming thing since 1983 and try to archive all the HL1 & 2 maps/mods I can get my OLD fingers on!!!!! 😉 I’ll be 70 in Feb 🙁 I think Phillip once called me a “Game hoarder” I think he was right!! I have the original “Half – Life” CD-Rom Inner packaging, (CD case used to replace damaged one’s from CD collection) bought back in ’98 and I bought “Opposing Force” as it was made available, inner sleeve and booklet also kept. I have them in my “Half-Life Generation” box; with it’s included games, including “Blue Shift”. I have the original PC DVD Rom “Half-Life2” packaging and disc. Extras include my notes about my first, and only, Steam account. Some rather rude so I may have had some early niggles with Steam! I forgot it had a ‘15’ rating. (UK)! I have “The Orange Box”. It was a monetary bargain and was bought so I could play the HL2 mod “Minerva: Metastasis”. But the episodes are amazing and I am still shocked it took me so long to play them! As for hoarding, I have boxes of 8-bit stuff and I gave away a sack of Commodore 64 games! I found my original “Half-Life” disc bolted to my old PC side cover as a fan shield! Original “Opposing Force” disc is still MIA!